The National Trust Scone Blog is three years old today! I know, I don't look old enough. Awarded 48 of them the Scone d'Or! Hidcote - a beautiful garden built by "a dull little man" according to James Lees-Milne but we loved it AND we loved the scones! Plas Newydd - a fantastic scone on Anglesey! We only really went there to see the Victorian dude who dressed like Noddy Holder 50 years before Nodders was born! Dyrham Park - superb scones AND free 17th century hot chocolate (the recipe is from the 17th century, not the actual hot chocolate)! Trengwainton Garden - the 5th NT scone we'd eaten in 48 hours during our Tour of Cornwall and it was FAB! Trerice - a quiet little manor house near the not-so-quiet town of Newquay, with AMAZING scones! Trelissick - the house may be relatively new to the NT but they've certainly got to grips with the scones! Boscastle - a little Cornish fishing village that was almost washed away in 2004 - unusual scones but absolutely top-rate! Acorn Bank - the third top-class scone on the Spring Tour to the Lake District! Sizergh Castle - amazing scone AND a copy of Wham! 's Greatest Hits! Wordsworth House - I was moved to compose a poem about the Wordsworth House scone - I expect a call about being Poet Laureate any day! Saltram - everything went wrong on our first trip of 2016, apart from the scone! Fountains Abbey - it was in the video for Maid of Orleans by OMD! And it had fantastic scones! Lanhydrock - our first foray into Cornwall and we were not disappointed! Fantastic scone! Biddulph Grange Garden - they had a singing tree and a golden water buffalo but nothing could upstage the scones! Nostell Priory - one of the best properties EVER with THREE types of scone! Coughton Court - 7 of the 13 Gunpowder Plotters were Throckmortons! Somehow they kept hold of Coughton and are still there today! Tredegar House - fantastic scones AND they keep a Dalek in the stables (Doctor Who is filmed there)! Anglesey Abbey - they have a working flour mill! You can buy bags of flour that you transform into scones that won't be as good as the ones here! Montacute House - they filmed Wolf Hall here! If only Anne Boleyn had been able to bake scones like these, it could all have turned out differently! Goddards - brilliant scones at the house once owned by Noel Terry, of Chocolate Orange fame! There used to be a Terry's Chocolate Apple as well! Sissinghurst Castle - did you see the scones, Orlando? They were great - and fantastic gardens too, in the former home of Vita Sackville-West! South Foreland Lighthouse - excellent sconeage in this 'shining' example of a National Trust property HA HA! The White Cliffs of Dover - I didn't see any bluebirds overhead but I did see two very, very good scones. And lots of ferries! Speke Hall - it has the River Mersey, it has a priest hole, it has a baker on Twitter, it has fantastic scones, I LOVED it! Studland Beach - famous for the UK's most popular naturist beach, for inspiring Noddy's Toytown, and now for very good scones! A la Ronde - a round house full of trinkets AND fantastic scones, what more do you want from life? Upton House and Gardens - a lot of pictures, an outdoor swimming pool, and truly excellent scones! Treasurer's House, York - they had a Christmas pudding scone with brandy butter that I literally still dream about! Hinton Ampner - lots of sheep and fantastic scones! Uppark - burned to the ground a few years ago while it was open to visitors, but now restored and serving very excellent scones! Stowe - it costs £30,000 a year to attend Stowe school - I'd rather spend that on scones, personally! Charlecote Park - William Shakespeare was once caught stealing a scone from Charlecote Park. Did I say scone? I meant deer. Bateman's - "Well I'm the king of the sconers/the tea-room VIP", as Rudyard Kipling would have written if he'd had scones at Batemans! Claremont Landscape Garden - more of a park than a garden but who's counting - the scones were fantastic! Standen - tests proved that the Standen scone was genetically closer to a cloud than a baked foodstuff! Nymans - another place that burned down (before the National Trust was involved), now serving amazing scones! Waddesdon Manor - they have a mechanical elephant that flaps its ears at Waddesdon but as an attraction it's no match for the top-class scones! Scotney Castle - the scones were EPIC. Scotney also had a Banana and Walnut Scone of the Month and Richard Gere, who filmed Yanks there! Dunwich Heath - they had 20 TYPES OF SCONE at the Sconeathon we attended! Sticky Toffee, Chocolate Orange, Apple & Cinnamon, Malteser...! Sutton House - Sir Ralph Sadleir of Wolf Hall fame built Sutton House - go along and see them bring out the sconies! Quarry Bank Mill - amazing scones in one of the most fascinating NT properties ever - you can even buy a tea towel made in the cotton mill! Flatford Bridge Cottage - we helped bake the scones at Flatford but we gave them 5 because they were mince pie scones and they were ruddy delicious! Winkworth Arboretum - a very understated place - not a fridge magnet to be had - but serving fantastic scones! Houghton Mill - the Scone Blogger was very hungover but she soldiered on and tried the scone made from home-milled flour, which was DELICIOUS! Brownsea Island - we didn't see any red squirrels, which shows that they don't have very good taste as there was a Sconeathon on the day we visited! Bodiam Castle - our very first 5 out of 5, setting the benchmark for all! If you'd like to see what 117 different NT scones looks like, check them out on Pinterest. 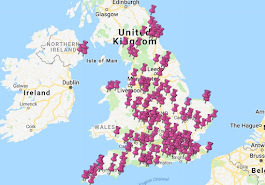 I'd like to thank all the lovely Sconepals that I have met along the way - keep sharing those National Trust scone sightings, either on Twitter or Facebook or Instagram. 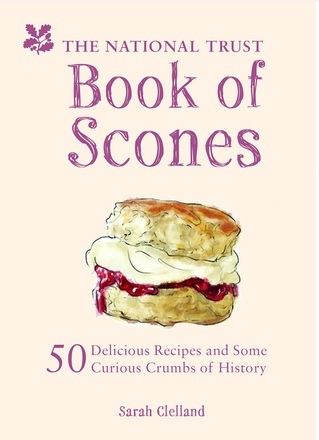 But the fact remains, readers, that I am still only half way through this National Trust Scone Odyssey. This weekend I start my quest to reach the other 120 or so NT properties that have tea rooms. Onwards! I've been to Dunwich and loved it... hoping to visit Claremont in November. Greetings from California!